Christina Trevanion and Thomas Plant shop around Warwickshire and Essex, get treated to a Battle of Britain airshow then head for an auction in Winchcombe, Gloucestershire. The aim - to make the biggest profit at auction. But it is no mean feat. -You have had your haircut! I don't know, a while ago. -I feel terrible, I didn't notice. Well, you always look so well turned out. You distracted me by talking about my hair. elegant but always willing to fight for a bargain. Hello. Have you got any bargains for me? dashing, dapper and cheeky chappy Thomas Plant. But Thomas has his sights on a comeback. He has £143.62 to shop with. -The sun will come out, the jumper will come off. You are resembling a middle-aged geography teacher this morning. I feel that is quite harsh. which dates from a time before seatbelts were compulsory. over 700 miles later, in Stoke-on-Trent. and aiming for auction in the Cotswold town of Winchcombe. Time to get Thomas's shopping underway. -Hi, Thomas, nice to see you. How are you doing? -This is my wife, Zoe. One is not finding this easy. The competition is tough. ..and relentless in her quest for thrashing me. So what we've got here is a vintage bracelet. Most unusual silver gilt bracelet. Look at that rock here. The matrix of the quartz. I like the fact that the links are quite textured. So it is silver, which has been gilded. it was mercury gilded to give it its good look. If we can... Not a fiver, but a bit more than that. OK, let's see what we can do, Thomas. Absolutely. Richard is going to have to get on the phone. -Oh, yeah, what is the news? -So, it' at 55. Usually, I'd stop around 50. -But we can go to 45. -45... Do think we could have this for 40? -Could you do a pound or two more? You know, I hate even...odd numbers. That's one done. Anything else? A letter opener with the clown on the top. Some people don't like clowns. But this is very Deco in style. It's been well rubbed and worn. I don't think I've ever seen a paper knife like that. It is quite a cool thing. I think I'm going to go for that. If that can be the right sort of price, definitely. See, I can put something else with it. You see? It's only, you know, £22. So what we have here is a brass Art Deco ink stand. Because in here is DR, 1922. So it was engraved in here. It has got a bit of a nick. It is a bit of a sizable nick. But once you put it in, you can't see it. So one would put one's letters there. And the ink goes in there. And your pens rest on here. Doesn't that look good? What is the price on that? Time to sweet talk Richard. You know, 38 and 22. -Well, so we're at 60. -I was more like thinking 39. That is a bit too low. -Can we meet somewhere in the middle? -Yeah, go on, we can work with 45. That is £86 for the paper knife, letter stand and bracelet. Heading for her first shop in the village of Long Marston. Lovely to meet you, I'm Christina. This is rather magnificent. -It goes on... Look, it goes on forever. -It does go on forever, yes. You've just got to start searching, Christina. -Having a nice time, are we? I probably really ought to start doing some more shopping, hadn't I? That is quite Thomas, actually. I can see him wearing that. It's all his colours. It is very this season. Look, very...lovely crushed berry colours there. That is very Thomas Plant. We'll leave that one there. I sold one of these on Saturday, and it was for the Savoy. It was for the Savoy Laundry company. It only made about £20, but it was wonderful. Look at that. "Articles for dry cleaners to be parcelled separately, please. 1971." just disposable? It wasn't really made to last particularly long. that sort of typography, that lettering... I love that. It doesn't have a price on it. Which is a bit worrying. I mean, really, I've sold one of those recently for £15, £20. -..securing it at, at the most. -Course I will, I'll do that now. -I may have a bit of good news for you. -Have you done your best for me? -I've done my best, course I have. -£15... That's a deal at 15. Right, let's go. With my laundry. And with that, Christina is up and running. He's here to learn the story of King John I.
who plunged the country into civil war. resting place of this controversial monarch. King John also inherited great territory in Europe. but lost after he sparked war with France soon after his coronation. and the king enforced them mercilessly. The rich and the influential barons were forced into rebellion. They seized London and forced the king to the negotiating table. that the Magna Carta was drawn up to restrict his power. and was created to halt the actions of a tyrant king. the king became gravely ill.
save his reputation in the eyes of both men and God. which already held the shrine of St Wulfstan. and hoped this decision would aid his immortal soul. that reveal the king's last-ditch attempts to save his legacy. Probably the most important item, in terms of this king, is his will. -So this is an original...? Do you think he actually wrote this or he got a scribe to write it? -He got a scribe to write it, but he probably dictated it. Because it starts, "I, John..."
rather than some formal greeting. So he is obviously speaking on his deathbed. -I'm holding a real piece of history. -It is. It is very special. with ensuring his son's inheritance to the throne. And then his other big concern is for his soul, his going to heaven. and money given to the poor. we would call nowadays executors. when he dies, his son will inherit the throne. protect his son and his own soul in his final moments. -Quite a lot of them are made up of people's names. He knew he was dying. That's real history. After his death, the tomb was placed directly in front of the high altar. to allow the tomb to remain in Worcester. The tomb is the earliest royal effigy in England. the monks to create the majestic Gothic building we see today. But the tomb has not remained completely undisturbed. In 1797, it was opened to record details of what remained inside. And unbelievably, various artefacts were removed. that included the front part of one of his shoes. It's extraordinary, isn't it? It's a fragment of his shoe. -or perhaps his coronation robe. and fears of a monarch on his deathbed. And Thomas is very lucky to be so close to them. And then we have got what is thought to be his thumb bone. Gosh, a royal thumb bone. resulted from his actions became the foundation of our modern democracy. of Worcester Cathedral to flourish. at alliteration-loving Fabulous Finds. Ha! Shop owner Caroline is on hand to show her around. Wander around with me, Caroline. Oh, look! You have got some unusual things. It feels like hunting for the Easter egg sometimes. That's right. You never know what you are going to find. You never know what you are going to find. Oh, that's nice. rather than silver. So you'd put your powder in there. And obviously, that would spin round. You'd have your powder puff on top and the mirror on the top. So you could just make sure that everything was in the right place. And then the enamel on the top. It's very Art Deco, isn't it? Very sort of 1930s, 1940s. £95. OK, all right. Is there any sort of negotiation in that? -OK, well, let's pop that back for now. I think that is a really charming thing. Thomas made a good profit on his compact at the last auction. "Interdit aux cyclotouristes et cyclomotoristes." -Something about cyclists and motor...? Interdit, so these are the things that you're not allowed to do. -..about road rules in France. -How much is on that, Caroline? -I've got 45 on that. Another one to think about. That is a stunner. Oh, my goodness! Oh, my goodness! -Can you manage? There we go. -Wow. Can I put that on top there? -It is Minton, you see. I mean, just the colourway is fabulous, isn't it? This one dates from around 1900 and has a ticket price of £140. but that almost looks like it's probably from the kiln. -OK. But £140 is quite steep for me. -I can do better for you. She'll hold you to that, Caroline. Oh, I love that. Is that copper? It is copper, yeah. It's wonderful. -Got a hole in it, hasn't it? What would you do with that? Is that some sort of mixing, cooking...? I think it probably was, yes. But nowadays, people use them in the gardens, don't they? -That's right, or a planter or anything like that. -..if you can be flexible on price. If you can't, then it's staying up here. -No, no, I can be flexible on price. -Let's go. Watch these steps. Crikey, that's four items and a combined ticket price of £380. Just how flexible can Caroline be? So I am thinking £140 for the lot. -And what about the compact? Can we say 150 for the lot? -Oh, you drive a hard bargain, don't you? -I think I've met my match! -Go on, then. Go on. Very generous, Caroline. Not bad for a day's shopping. But time to put all that excitement to bed for one night. So off you go, you two. And...nighty-night. and our experts are up with the larks. -It is quite foggy, isn't it? -It's really foggy! And it's really early. I know, it is immensely early in the morning. That lot set her back £165. and a polished brass inkwell. He shelled out a total of £86, so has £57.62 for today's shopping. -Geography Teacher. Is it left or right? You have got that jumper on again! I'm going to have to surgically remove that jumper from you. cross-country and are headed for Steeple Bumpstead, in Essex. -Now, I've been here before, Thomas. Oh, this man is an absolute delight. Well, I don't think it's open. No, I'm sure... I remember Graham from last time, he's lovely. -I don't think it's very open, though. -It can't be closed, can it? -I suppose it is quite early, isn't it? Oh, well, I guess we'll just have to wait then. I spy with my little eye something beginning with...B. -Go on, give me a clue. -Thankfully, Graham is here to save us all. I've got lots of toys and things in here. We've got a novelty money box there. but that one looks like it has been repainted. are the guides as to what your picture was supposed to look like. So cats, Katzen, gati, katten. Is that the rear end of the donkey, do you think? These are very worn, sadly, aren't they? But nonetheless wonderful. But these...these blocks are really rather lovely. And still, it looks like it has got all its pieces to it. So you'd have to assemble these cubes to create your picture. so we're probably looking at sort of 1880, 1910. But there is no ticket price. So how is Thomas getting on? Graham, what has this goblet got to be? The goblet and the dish, £60. Is that your very best on that? No, it could be 75, which is even better. I was thinking that these could be 30 quid. -Because that would make it 60. -It is a nice sort of goblet and dish. Signed, I think, one is. -And, yeah, they're Danish, of course. Have a little think around and we'll see. -and I'll walk around and see what else I can see. Good strategy. But Graham's work is not done yet. I love your shop and I would like to buy something from you. I did see this, which is a really, obviously, lovely Victorian puzzle. And I was sort of thinking maybe £10 to £15, really. -Would that be a goer for you? -I can do it at around 25. -I mean, it has seen better days, has it not? I really can't. I mean, really, my maximum was ten. I'll meet you in the middle at 15 and that's my absolute death on it. -OK, yeah, we'll do that. -Brilliant. £15, I'm a happy girl. -Great. Thank you very much. Christina lands the Victorian wooden puzzle for £15. And just like that, her shopping is complete. Looks like you have got the run of the shop, Thomas. Anyway, time for some more negotiating. Round two. -Now, how about that goblet and dish? I'm terribly sorry, but I can't do it at that. Where could we go? And I can't do 40. -And I don't really want to go over 35. -Sorry, Thomas, I can't on those. You drive a very, very hard bargain, you really do. -OK, I will do it at 35. -You are not a silly man. Thomas got his goblet and tray for £35. The bad news is he has less than £23 left to shop with. Christina is on her way to Duxford, where she is in for a treat. an invasion, which brought the war to the skies over Britain. For three months, the RAF repelled relentless attacks from the Germans. RAF Duxford played a crucial role during the Second World War. showing the aerial prowess of these restored aircraft. to the most famous of all - the Spitfire. in all the public's imagination. airplane that is beautiful, but it really is, isn't it? You can see why those young pilots absolutely loved flying in it. Spitfires in existence around the UK. which is flying in the show today. -So I am flying that in the first slot. -And then we have also got a lovely Mark I Spitfire. Which is now owned by the Imperial War Museum. -But it was a 1940s Duxford airplane. -So it is very famous. -So what is it like to fly a Spitfire? The first reaction is, of course, they are lovely. You sort of don't get in one, you put it on. It becomes part of you. But as a flying machine, stunning. Absolutely stunning. do you think it will give you a real sense of what it was like? will really make you realise what those boys were doing. and for others in long-range bombers. A seat in a Lancaster bomber was one of the most dangerous places to be. Some 55,000 aircrew died in raids over Europe. The life expectancy of new aircrews was just two weeks. One veteran of these bombing raids is gunner Don Chinnery. I went in the early part of the war. -And I toured all through the war. that was your full tour. and you went back for a second trip. What was it like to be in a Lancaster? -I would be back in tomorrow, if I could. those heroic actions of air crewmembers like Don. Esther, tell me, what is happening here? It's all happening in the skies above us at the moment. -back in the Battle of Britain. Really, I've got tears running down my face. what it would have been like during the Battle of Britain. relentless from July to September, throughout 1940. -Just makes you realise how special those young men were. Look how close they are getting. I feel like I should be ducking. It must have been very difficult to deal with emotionally. And people watched these dogfights happening, didn't they? actually, those are our boys up there fighting. It must've been a very, very emotional experience. Thomas still has some shopping to do and is headed to Debden Barns. Dealer Andy is on hand to help out. Oh, that was good, wasn't it? Are you into breaking things, Andy? It's my main talent, actually. I love that. Look at that. What can you find for your slender budget then, Tom? These are our main cabinets for some silver and bits and pieces. Yeah, well, my budget is really quite low. -Do you want me to level with you? Have you ever been laughed out of a shop before, Thomas? I have some stuff which really got left behind. I have one very intriguing piece. In fact, a couple of very intriguing pieces. OK, I'm intrigued. I'm getting more intrigued. which currently resides in the back of his car? I have been brought to the back of, um, Andy's vehicle. And it is like a dusty...a dusty experience. -Now, I used to do a little bit of jewellery. Trifari are one of the most famous houses of costume jewellery. once for about 30 quid, but I didn't. You see, we've got nine carat gold. -A little pearl in there. -Look at you. Right, OK.
All right, what else are you going to pull out? -This is like Mary Poppins' bag. but nobody else can tell me. in what is now Turkey. However, this is rather more modern. -Peacocks. And it is just a bud vase. -You put one budding flower in. you're not going to get a lot of them, a big bunch of roses. What a fun thing that is, isn't it? What a beautiful object. -But you know my position. -£22 and a couple of pennies. The Trifarian stuff - the rings - I mean, they are just leftovers. -This, it didn't cost me a lot. -So this could be my lucky day. -and that bit of jewellery in there? of four rings and three necklaces. Thomas is now all spent up. for the climax of those astonishing aerial displays. He just needs to find her. Air Cadet Plant seems to have been distracted. He never misses an opportunity to dress up. let alone climb up the ladder. aspects around the shops we go to, the museums we see. To actually try it on, it actually brings it home. It is very sobering. You are just in time, look. Absolutely mind-blowing. -I've had a good look around. -No, I haven't bought anything! -Have you been dressing up? It is just so emotive, isn't it? It's just that lovely noise, that fabulous noise. And these planes are sort of over 75 years old. -They really are national treasures, aren't they? As are the people who flew them. What a sight to see, eh? This incredible road trip is nearly at an end. to arrive at their final destination in Winchcombe. and a Victorian child's puzzle. a tin-glazed vase and a collection of jewellery. So what do they make of each other's items? I adore that peacock vase. I just think the colours in it are quite splendid. And that little job lot of jewellery that he got... What did he pay? The compact is great. The quality of it. The painting is brilliant. She is sort of in my wake now because I beat her last time. Am I going to beat her this time? I don't know. All will be revealed at the auction in Gloucestershire. It is very good to see you looking so jollily clothed this morning. -No jumper, thank the Lord. Do you know, the sun is out. It's shining. You dressed your trousers to match the van, I like it. You know, I thought about my outfit because you were so harsh last time. -Oh, I didn't mean to be. You know, "Oh, you look like a geography teacher." Phil Serrell was a geography teacher. Anyway, a packed saleroom at Bespoke Auctions awaits. -rock and roll. Where are you? The bracelet is silver gilt. valued on the metal value and content. Quite a nice piece. The enamel compact is most probably my favourite. The guilloche enamel is in wonderful condition. I think that will do quite well. Thomas spent all of his £143.62 on six items. Christina also gathered up six lots for a total of £180. Woo, it's rather exciting. Did you see the parrot? Oh, I love a parrot. Thomas. It is your Art Deco paper knife. Starting at 15. 18. 20 now. -22 in the room. Thank you. Straight away on my left. At 22 now. Looking for 25. At 22 with you, madam, in the pink. -That's all right. I'm pleased by that. Christina fell in love with the Victorian puzzle. Will the bidders? Start the bidding here at 15. 18. £20 now. At 22 now, looking for 25. -And five on my left, thank you. -On my right. 25. And eight. Would you like to go 28 now? And 30, sir, would you like to go? That is everyone off to a good start. -Straight out of the box! -Ha! Straight out of the box! Thomas. Let's hope it was worth it. Start the bidding with me on the book at £40. 40 I've got. Looking for 42. At 40 bid with me, a commission bid. Small profit, but creeping forward. Time for Christina's laundry box. It is a London Laundry Coventry laundry box. Reminds me of my days in Savile Row. Going to start the bidding with me, a commission bid, at £15. -Looking for £18 now. 15 bid. At 18 now. In the room now with you, madam, at £18. Looking for 20. Don't know what's inside it, have you had a look? At £18, we're selling then. -And sold, thank you very much. That just about holds its own. Thanks. Just a bit out-of-the-way. back into this road trip. We've got a bid here at 20. 22. Five. Eight. I've got 30. 32 on the net now. And five, madam? Thank you. 35. I'm looking for 38 now. And eight in the room now. 38. And 40, madam. And two, sir. -42. And five. Are you sure? Shakes the head. -45. With you, sir, at 45. Looking for 48 elsewhere now. At 48 in the room then. And 50 in the room, back of the room. That is a very decent profit. -Thomas, you might make it over £200 at this rate. -Well, I've got high hopes for my vase. Now, a very large copper bowl with several holes in it. At £15, asking. 15 we have. I'm looking for £18. -Something to wash your feet in at night, maybe. At £15 we've got. Although it is not big enough to be a Jacuzzi. That is not making it any better. I've just lost a lot of money. In the room at 20. Looking for 22 on the net. At 22. And five, sir, would you like to go? 25 now. At 25. And 28. Looking for 28. At 28. And 30 in the room, thank you. With you at 30 now. At £32 for the footbath... And sold. -Horrendous. He worked jolly hard. He certainly did his best. But it is still a loss, I'm afraid. It is the first of Thomas's car-park purchases. OK, we start the bidding at £15. And 18. Looking for 20 now. -So you made a profit. Looking for 22. Some dust on there, for nothing. 22 now. Looking for 25. At £22. Once, twice... At £22... And sold. Almost doubling his money, that's a great result. Christina's lagging behind a bit, and it is her enamel compact next. -Who will start the bidding on that? At £40? -All the hands go up at £40. 42. 45. 48. 50. 55 at the back there, looking for 60. And 60. And five, sir? Sold to the back of the room. An excellent profit that brings it neck and neck. You sounded immensely Welsh then. Thomas loved this 1970s bracelet. Will it be a winner today? Let's start the bidding, ladies and gentlemen, on that. At £15. At 15. 18. Looking for 20. 20 bid on the net. Looking for 22. Are you going to buy as well? You going to bid? I'm going to lose all that money. Looking for £28. At 25 on the net now. And eight. Looking for 30. At £28, we are selling. And sold. Thank you. You see, that was a bad thing. I lost. Big loss. Oh, the first loss of the day for Thomas. -You've still got your Persian vase to go. -Still got that to go. That is going to make £2 million. Christina has her own ceramic offering, it is a Minton jardiniere. We'll start the bidding on that at £40. Looking for 40. Looking for 40. At £30 I have now, at 30. At 32. And 35. -It's moving up. We'll get there in the end. -And 38. And 40, sir. I'm asking 42. 42. And five, sir? -It's so beautiful, look at it. 48. £48, thank you, on the net. 50 in the room now. -And 60, sir? Are you sure? Shakes his head. Once, twice then. At £55 to the net. Sold. A small loss, but Christina is still in the lead. You were sort of going into this crescendo in Ireland and Wales. I was. I was going almost stratospherically well. And then suddenly we come here and it's...pooooom. bought out of the back of a car. This is my final hope. At 30. Now with me. 32. 32. And five. 35. And eight. And 40. At 42 with you. I'm looking for 45. 60 at the back. And five. 65. Fair warning then. At £65. -Jolly well done, Thomas, that's fantastic. Their final lot of the day is Christina's French cycling poster. At 50 in the room. Straight away now. Looking for £18. At 15 now. Have I got 18 elsewhere? At 18 at the back there. At 18. £20 back with you, sir. At £20. We are looking for 22 elsewhere. -Going to have to sell at 20 then. -I want to go back to Ireland. Zut alors! After costs, that is a small loss. Have I beaten you again? Have I beaten you again? Time to find out, Thomas. of £1.24, leaving her with £269.07. after costs of £42.52, giving him his second auction victory in a row. He now has a total of £186.14. But Christina holds on to the lead for the decisive next leg. -It's a great result - two auctions each. -Oh, I don't like this. This is making me feel quite uncomfortable. You never know, Christina, I might catch up at the last auction. Next time, Christina and Thomas face their final leg. I cannot believe it has gone so quickly. Christina pulls out all the stocks. We could get Thomas in there. But Thomas isn't going down without a fight. 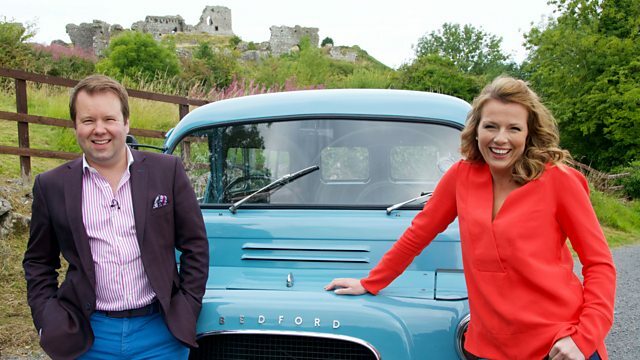 In the penultimate leg of their journey, Christina Trevanion and Thomas Plant shop around Warwickshire and Essex, and they get treated to a spectacular Battle of Britain air show. They then head for an auction in Winchcombe, Gloucestershire.